Influenza (commonly known as the flu) is very different to a cold but people often confuse the two. Both are caused by viruses but if you have the flu, you become much more unwell. The flu affects your body's respiratory system, which includes your nose, throat and lungs". When someone with the flu coughs, sneezes and talks, they release droplets into the air. You can catch the flu by breathing in the droplets. You can also catch the flu by touching something (such as a door handle) that has the flu virus on it then touching your mouth or nose. Some people have a higher risk of getting the flu than others. This includes people over 65, pregnant women, and people with ongoing medical conditions. These people also have a higher risk of becoming very unwell with the flu. 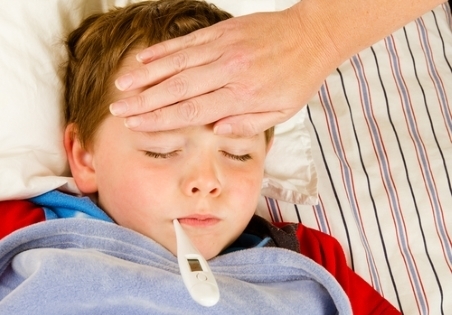 Flu symptoms usually last for five to seven days. They include high fevers, sweats, muscle and joint aches, headaches, lack of energy, sore throat, chesty cough, and runny eyes and nose. Some people with the flu will need to go to hospital, and every year people die from the flu. The flu causes people to miss work, school, university, and so on for a least a week, but it can often take several weeks to return to normal health. If you're unwell, it's important that you stay away from work, school, and gatherings of other people. See your doctor if your symptoms get worse or if you're worried. If you have an ongoing medical condition or are 65 or older, see your doctor because the complications of the flu could be worse for you. To help stop the spread of the flu, use disposable tissues and cover your mouth or nose when coughing or sneezing. Use good hand hygiene to stop the spread through contact with others. Treatment for the flu is aimed at relieving symptoms. You should rest and drink plenty of fluids. You can take over-the-counter medicines like paracetamol and ibuprofen (ask your GP or pharmacist for advice) to help reduce your temperature and relieve any aches and pains. Carefully follow the instructions on the label about how much medicine you should take and how often you should take it. It's important not to take more than the maximum dose. Doctors no longer recommend Tamiflu (oseltamivir) for treating the flu and it isn't subsidised. Health professionals encourage everyone to have a flu vaccination to protect themselves from the flu. You can get a flu vaccination at your general practice or at some pharmacies. It's free if you're 65 or older, or pregnant. It's also free if you have certain medical conditions, or are under 18 and live in certain areas of the country. See Fightflu for a list of who can get a free flu vaccination. If you are not eligible for a free flu vaccination, you will still benefit from having a vaccination. Discuss this with your practice nurse or GP. Information about influenza, including symptoms, treatment, and prevention, and how to care for yourself and others. A fun and informative Canterbury DHB website about preventing the flu, how to get vaccinated and how to cope when someone in your whānau/family has the flu. Written by HealthInfo clinical advisers. Last reviewed May 2018. Last updated November 2018.